They will welcome you at Chez Joseph's, with fresh juice, coffee and traditional Greek cookies. Katerina Remoundou will give you an introductory lecture to the cuisine of the Cycladic Islands and particularly of Andros, as well as, to the unique local products of our island. 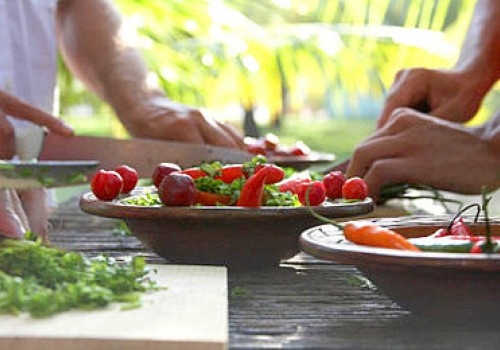 The island yields a bounty of unusual indigenous herbs and vegetables. You will learn about the local cheeses and sausages, with a live demonstration of different recipes. When the dishes are prepared and cooked, you will be able to enjoy the fruits of your labors accompanied by a glass of delicious Andros wine or raki.